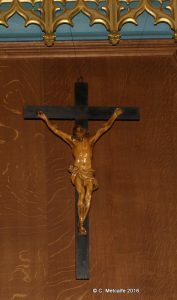 This carved figure of Christ on the Cross rises up from the Chancel Screen. 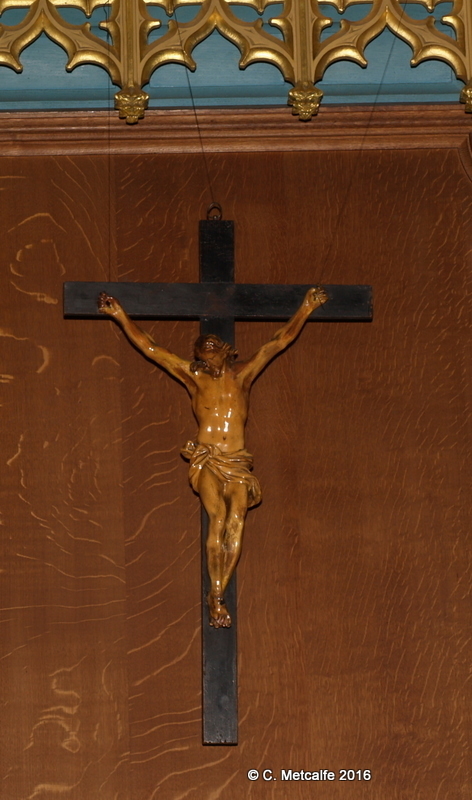 The figure is beautifully designed, drawing the eye upwards to heaven, yet showing the agony of crucifixion. According to the 1961 Church Guide, the Rood Figure was designed by Sir Ninian Comper, and was placed in the traditional position on the Chancel Screen, in memory of the late Sir Walter and Lady Hargreaves. Another word for the Chancel Screen is ‘rood’, meaning a wooden or stone screen separating the nave and choir of a church. 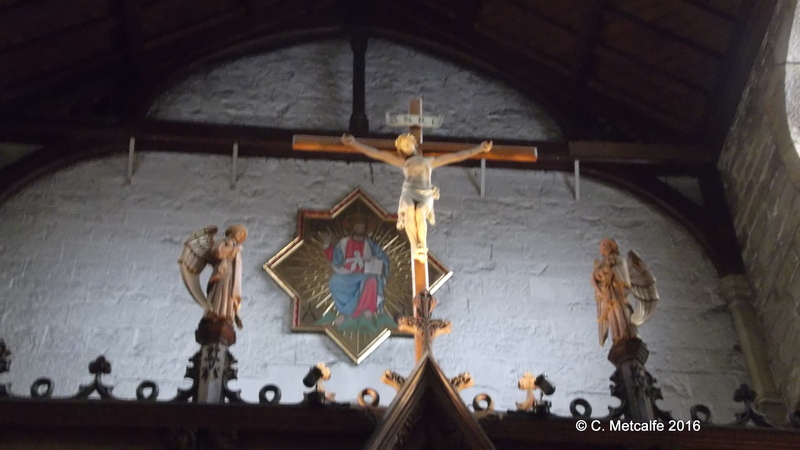 In medieval times churches usually had a rood screen and a rood loft, which was a gallery above the screen. The Screen was apparently designed by Arthur Blomfield (1829-99). It was installed in 1919, after the Great War. It was given by the parents of Second Lieutenant Guy Francis Ormond Devitt of the Rifles Brigade, who was killed on 30th July 1915. Sir (John) Ninian Comper (1864-1960) was a famous architect, whose work includes windows in Westminster Abbey. He was born in Aberdeen and was the son of the Rev’d John Comper. The Rev’d John Comper was a friend of the Rev’d John Mason Neale, the Warden of East Grinstead’s almhouse, Sackville College, from 1846-66. After Neale founded the Sisters of the Society of St Margaret, the Rev’d John Comper, Rector of St John’s, Aberdeen, asked Dr Neale if one of the Sisters could be spared to work in this parish. First one, then several Sisters went to Scotland and a house was taken for them in Gallowgate in 1864, beginning a small community of the Society of St Margaret in Scotland. Dr Neale commented that ‘Comper is such a pleasant man to work with’. Neale liked High Church practices and was a Founder of the Cambridge Camden Society and the Ecclesiological Society, when studying there. Neale became Godfather to Ninian, (1864-1960), the son of the Rev’d John Comper. Neale died in 1866, and was therefore only Godfather to Ninian for a very short time. However, the influence of the Anglican High Church ‘was the motivation and mainspring’ of Ninian’s work as an architect,’ according to biographer Anthony Symondson. Sir Ninian Comper’s work was intended ‘to fulfil the rubrics of the Book of Common Prayer and apply them to the modern age’. The author P.F. Anson refers to ‘those exquisite medieval re-creations of Sir Ninian Comper’. John Mason Neale loved aspects of the medieval church before the Reformation and would have approved. Therefore it seems appropriate that this figure on the rood screen, designed by Sir Ninian Comper, is close to his Godfather John Mason Neale’s own crucifix, which hangs on the High Altar in St Swithun’s for much of the year. Guide Books to St Swithun’s Church 1961, 1988. P. F. Anson, The Call of the Cloister (SPCK: London, 1964), pp. 145, 350.